Melt butter in saucepan and sauté diced onion over med-high heat. Grate garlic into pan with onion and sauté until mixture is soft but not brown (about 5 min.). Set aside to cool. Place mayonnaise, Dijon, celery seed, tobacco and Worcestershire together and combine. Add the egg and cooled onion/garlic mixture. Add to the crab along with ¼ C Panko crumbs and fold into the crab trying not to break up the lumps. Place rest of Panko crumbs into a plate. Measure out 4oz portions, creating a round disk. Coat crab disk with Panko and place on cookie sheet. In a fry pan add oil and heat on med-high heat until smoking. Place as many crab cakes as you can into fry pan without them touching each other. Pan fry until dark golden brown. Turn and brown on other side. 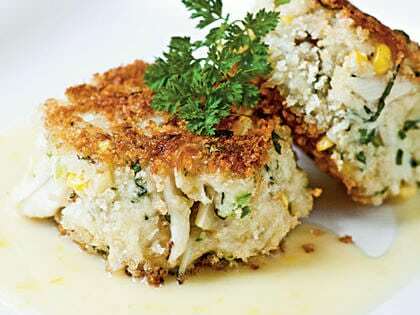 Place crab cakes on cookie sheet when done browning and place sheet in the oven for 5-7 minutes. Take out of oven, squeeze lemon over top and sprinkle julienned basil on top. Serve with preserved lemon aioli.